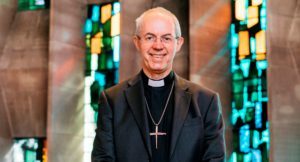 The Archbishop of Canterbury, the Most Revd Justin Welby, will be visiting the Diocese of Peterborough from Monday 8th April to Wednesday 10th April. The three day visit will see the Archbishop meeting people and visiting church projects throughout Northamptonshire and Peterborough, culminating in a public ‘Wednesday at One’ service at Peterborough Cathedral on Wednesday 10th April at 1pm. During his stay, the Archbishop will be visiting a variety of projects, including Good Loaf (a café and bakery in Northampton providing employment opportunities to local women), Garden House (a daytime homeless shelter in Peterborough), a Wellbeing Café based at St Giles Church, Northampton (which aims to support people affected by mental health issues) and a Gym Chapel based at Corby Epiphany Church. The Archbishop will also take a trip to Franklin’s Gardens, the home of Northampton Saints RFC, and also visit the Diocese’s office in Northampton. Here he will learn about the extensive youth work being undertaken by the Diocese of Peterborough, funded by a grant from the Church of England’s Strategic Development Fund. In addition, he will attend a supper with other faith leaders in Peterborough, as well as taking part in a Q and A with clergy and lay ministers within the diocese. The Archbishop will also be launching a new app called Gamar, which will enable visitors to take an interactive trail through Peterborough Cathedral. You can follow the Archbishop’s visit via @peterboroughdiocese on Facebook and @Peterborodio on Twitter.